We were quickly outgrowing our little studio, and desperately needed running water for the winter months. So we launched our Kickstarter campaign in late spring to help fund the move to a new, larger studio with running water! We raised $13,526 from 290 wonderful backers, who purchased our Kickstarter colorways to help fund this project. We’re still working on getting settled in the new studio, and no doubt will be rearranging the furniture for a while to come! The basement undergoing construction to make way for our new studio! Another shot of the new basement! Monica knitting with the Kickstarter Fade Collection! The Entomology Collection Colorways. Left Column from top to bottom: Hubbard's Caterpillar, Cecropia Caterpillar, and Praying Mantis. Right Column from top to bottom: Luna Moth, Burnet Moth, and Leaf Hopper. The Entomology Collection Semisolids, Caterpillar Purple, Caterpillar Blue, Leaf Hopper Blue, Luna Blue, Mantis Green, Mantis Yellow, Caterpillar Orange, and Burnet Pink. The Botany Collection Colorways. Left Column from top to bottom: Jack in the Pulpit, Elderberry, and Wild Mustard. Right Column from top to bottom: California Poppy, Prickly Pear Cactus, and Succulents. The Botany Collection Semisolids, Elderberry Purple, Cactus Fruit, Pulpit Berry Red, Poppy Orange, Mustard Yellow, Pulpit Green, Succulent Green, and Pulpit Brown. November's Botany Club: Fade Collection in Black Tacca, Colorway in Black Tacca, and Coordinating Semisolid in Tacca Blue. 2017 was the year of the club subscription! Here are all the gorgeous club offerings from all three collections. They were very well received, and we really enjoyed making new colors every month! June 2017 Club (left to right) Tanager Green & Green Headed Tanager, Wasp Purple & Cuckoo Wasp, and Lilac Purple & Lilac. July 2017 Club (top to bottom) Nuthatch & Nuthatch Blue, Blue Cohash & Cohash Blue, and Horned Caterpillar & Caterpillar Orange. August 2017 Club (left to right) Cecropia Moth & Cecropia Pink, Merganser & Merganser Brown, and Helleborine Orchid and Orchid Green. September 2017 Club (left to right) Hopniss & Hopniss Flower, Rufous Red & Rufous Tailed Hummingbird, and Leopard Moth & Leopard Moth Blue. October 2017 Club (left to right) Jewel Weed & Jewel Weed Stem, Barn Owl & Owl Brown, and Caterpillar Green & Monarch Caterpillar . November 2017 Club (top to bottom) Violet Backed Starling & Starling Pink, Black Tacca & Tacca Blue, and Bush Grasshopper & Grasshopper Purple. December 2017 Club (left to right) Pine Grosbeak & Grosbeak Gray, Dragonfly & Dragonfly Blue, and Juniper & Juniper Berry. 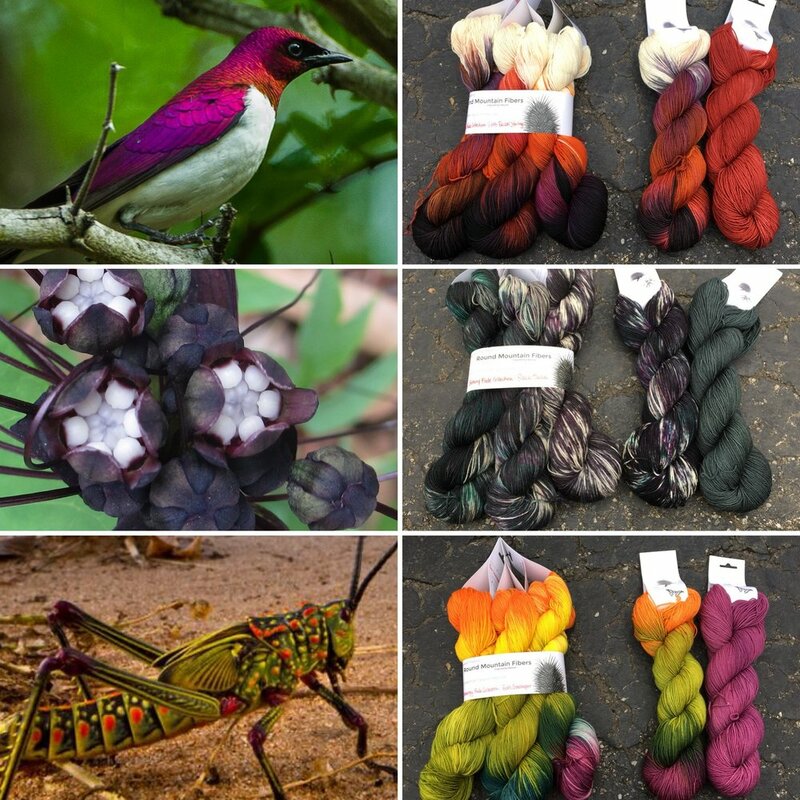 CLICK HERE TO FIND OUT IF YOUR LYS CARRIES OUR CLUB! International Customers Click Here to Subscribe to Club! We continued to offer pattern suggestions through Facebook, and made those pattern suggestions searchable with hashtags #RMFfingering etc. To search our suggestions, see the post pinned to the top of our FB page! We discovered the work of the incredibly talented Jennifer Kirchenbauer, who designed a series of really fun, elegant, and unique garments to showcase our yarns! Her garments are currently on tour with the Round Mountain Fibers Trunk show, and have made an appearance at Vogue Knitting live, Seattle, as well as Vogue Knitting Live, NYC! We are super excited about her work, and are offering kits through our LYSs, as well as our International Outlet Store. The Pass Key Scarf knit and designed by Jennifer Kirchenbauer of LavishCraft. The Pass Key Scarf pattern kit in Wild Mustard and Succulents. The Oriflamme Shawl knit and designed by Jennifer Kirchenbauer of LavishCraft. The Divisionism Shawl knit and designed by Jennifer Kirchenbauer of LavishCraft. To see where the Trunk Show is going next, CLICK HERE! We Launched our International Outlet Store! As a wholesale business, our priority has always been our relationship with our Local Yarn Shops, as they are the reason we’re in business! However, we did need an outlet for our seconds and one-of-a-kind experimental colorways. So we launched our Seconds Store through www.roundmountainfibers.com. We discovered that we had a significant fan base in Canada, and after being in touch with several Canadian LYSs we realized that the exchange rate and cost of importing made the sale of our yarns prohibitive for Canadian shops. So we decided to launch our International Outlet Store, at www.roundmountainfibers.biz so that we could offer all of our products to our international fans. We’re super excited about this venture, and look forward to shipping our yarn all over the world. So far, we’ve shipped to countries far and wide, including Australia, Vietnam and Germany! Bittersweet Berry and Bittersweet Berry Pooling Semisolid. Dogbane Blue and Dogbane Blue Pooling Semisolid. Bee-Eater Blue and Bee-Eater Blue Pooling Semisolid. We had lots of giveaways this year and look forward to many more in 2018! 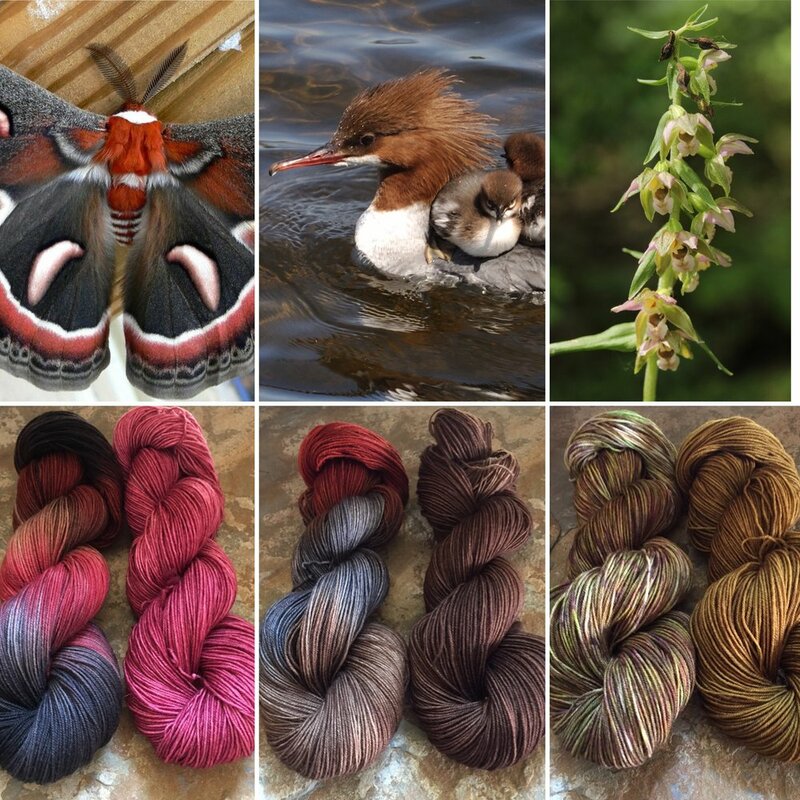 Here are a few examples of the beautiful yarn we gave away this year! Win this yarn for you and a friend! See giveaway details below! 2. Tag a friend who would love to win free yarn. When we reach 5,000 'likes' on Facebook, we'll give you AND your friend this yarn! Each skein contains 400 yards of hand-dyed superwash Merino deliciousness. One is our regular semisolid, and the other is our NEW for 2018 Pooling Semisolid!